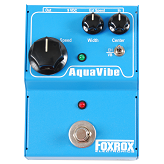 Analog Man carries the Foxrox AquaVibe Uni-Vibe Pedal, a compact vibe pedal that uses classic analog vibe circuitry to produce watery phase and vibrato sounds. Dimensions Width = 3.85" Depth = 5.15" Height = 2.85"
*Voltage: 9 Volts DC (external). AquaVibe’s current draw is too high for running it on a 9 Volt battery. It would die in a matter of minutes. You can power AquaVibe with voltage ranging from 7 Volts to 15 Volts. Since the voltage is internally regulated at 5 Volts, feeding it higher voltages does not affect performance. Do not exceed 15 Volts.